From Goodreads: Eleanor Fitt has a lot to worry about. Her brother has gone missing, her family has fallen on hard times, and her mother is determined to marry her off to any rich young man who walks by. But this is nothing compared to what she’s just read in the newspaper—The Dead are rising in Philadelphia. And then, in a frightening attack, a zombie delivers a letter to Eleanor… from her brother. Whoever is controlling the Dead army has taken her brother as well. If Eleanor is going to find him, she’ll have to venture into the lab of the notorious Spirit-Hunters, who protect the city from supernatural forces. But as Eleanor spends more time with the Spirit-Hunters, including their maddeningly stubborn yet handsome inventor, Daniel, the situation becomes dire. And now, not only is her reputation on the line, but her very life may hang in the balance. Eleanor Fitt is a fantastic protagonist: strong and smart and funny, definitely no damsel in distress. And Daniel! He’s equal parts hilarious and alluring. He and Eleanor have awesome banter. But my, do they have problems. Their world is falling apart around them, and they learn pretty quickly that nothing is as it seems. There are twists and turns and tremendously written action sequences around every corner, which made this book the best kind of page-turner. One of my favorite aspects of Something Strange and Deadly was the way the elegant Victorian setting contrasted with the eerie creepiness of the Dead. It was a trip to be immersed in fancy turn-of-the-century customs in one scene, then, in the next, to be thrust into a spine-tingling supernatural confrontation. But it TOTALLY worked. Susan Dennard’s voice and style and attention to detail are amazing — perfect for this unique and suspenseful story. 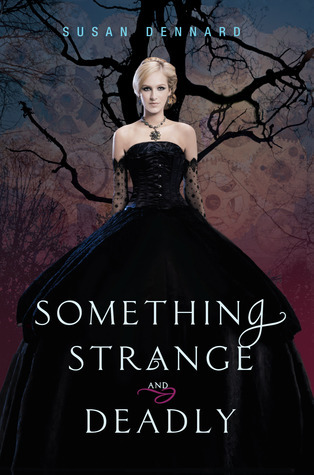 Definitely check out Something Strange and Deadly when it debuts in July. 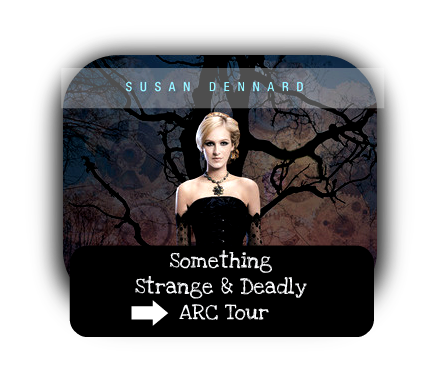 Something Strange & Deadly ARC Tour! Tell me: What’s your favorite scary story? Cool. I’ll have to add this to my ‘to read’ list which is growing exponentially! Glad you’ve got SS&D on your list, Elodie. It’s definitely a fun and super-unique read. I bet you’ll enjoy it! Speaking of book twins, Erin, I’m about 50 pages into GRACELING and already falling in love. I want to just sit and read it ALL DAY! YES. Eleanor is awesome! And such a great role model. Sounds awesome! I’ll have to add it to my TBR. Thanks, Katy! It’s a very fun read, Alison. Hope you enjoy! This sounds great! I’ll add it to my list right now. I’m enjoying your A-Z! Thanks, Liz! I hope you enjoy SS&D! Ooohhh…this sounds really cool! I’m not big on zombie books, but the other elements are really intriguing, so I think I’m going to have to get myself a copy when it comes out. Thanks for the review! I’m not big on zombie books either, Tracy. Other than THE FOREST OF HANDS AND TEETH, SS&D is the only one I’ve truly enjoyed. There’s so much going on, and Eleanor is so awesome, it’s hard NOT to love! A definite add to my TBR list – thanks for the reco! And my fav scary story? Hmmm…not sure if I’ve really come across one of those yet. I did appreciate the creep factor of the unconsecrated from The Forest of Hands and Teeth – Carrie Ryan did a fab job with her undead! You know, I’d never really thought about the name Eleanor until I read SS&D, but this story totally made me a fan! I just received a copy of this one, and am even more excited to read it now. The steampunk/zombie/historical combo sounds just too fun. So glad to hear it’s a great read. I haven’t heard of SOULLESS… I’ll have to check it out if it’s anything like SS&D though! It’s definitely a fun one, Steph! My pleasure, Jaime! I hope you’re able to pick it up when it debuts, and I hope you enjoy it as much as I did! This sounds great. I love creepy, so it’s right up my alley. Ooh…I love the sound of this. Actually, since I just read Abraham Lincoln: Vampire Hunter, I’ve been in the mood for something strange and spooky. Thanks for the tip!